Since the modern version of the term was first introduced, 'influencers' have gradually eked their way into the mainstream but, as the sector matures, the media (and the layperson) seem no closer to working out exactly what it means. Recent TV coverage – including Netflix's recent Fyre Festival documentary and this week's BBC Panorama on the subject – have brought influencers into even sharper focus but, according to the industry professionals we asked, the definition remains blurred. An influencer is "someone who creates unique content that reaches and engages people within a specific target audience", says Katy Blake, a social media strategist at digital marketing consultancy Anchor Social. She adds: "They may also curate content, but they have to be making their own content, too. They might talk about more than one area, but I'd expect them to generally be quite well linked." Blake was eager to stress the importance of the relationship between the content curator and their audience. 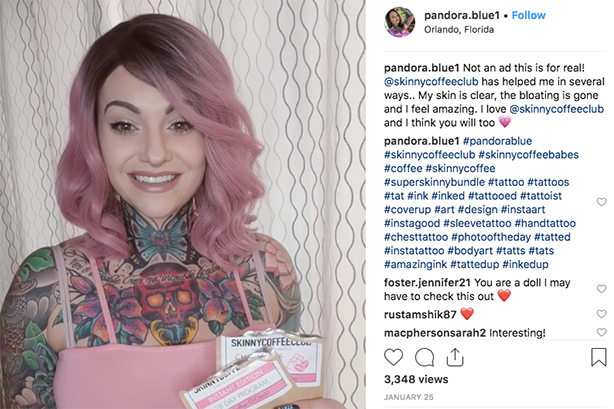 "Influencers hold the ability to make people stop scrolling for their content, and to build relationships that mean the followers know and trust the influencer," she says. "Without the engagement, there is no way to measure how much sway the influencer actually has over their audience." Blake also dismissed the idea of taking the term literally: "You can't be an influencer just because you can get a message in front of a lot of people, in my opinion." McDonald's UK claimed its recent Big Mac Bacon campaign, featuring Jamie & Harry Redknapp was its 'most-successful piece of influencer content to date' – but are the football personalities really 'influencers'? According to Karmarama's social and influencer lead, Katie Hunter, we should be going be going back to basic definitions. "An influencer to me is anyone with influence in its purest form," she says, "whether that’s because they’re an inspiring speaker, a force for social good, a respected artist, a leading gamer or an expert in travel." Hunter baulks at the sector's portrayal in the media: "We definitely need to stop thinking about ‘influencers’ as YouTube celebrities, Insta-stars or a way to buy quick reach or advocacy. A lot of the coverage recently (often negative, let’s be honest) focuses on a very shallow pool of (often very famous) creator talent that certainly isn’t representative of the enormous breadth and endless possibilities open to us through influencer marketing now." However, Ketchum's Ben Owen disagrees: "They predominantly are social media users, with a high following, who promote a brand’s products and service by creating their own content on various media outlets such as Instagram or YouTube." He also add an alternative definition: "An influencer can also be off social media channels, a renowned figure in the public eye eg. celebrity, royalty, sports star who can influence others naturally with their behaviours, possessions or acts. For example, the Duchess of Cambridge is an 'influencer' on ladies fashion." James Herring, managing partner at Taylor Herring, believes the social media aspect is a line in the sand: "An influencer is an individual with a highly engaged social media fanbase," he states. "They should possess significant credibility or authority within a given industry or niche audience segment. As such, brand marketers will seek to leverage that influencer’s advocacy to achieve sales from that same, shared-interest, audience." His definition is accompanied by a sense of frustration: "Agencies and brands appear to be mining the exact same influencer lists across the board," he claims. "The ‘mum-fluencer’ list. The ‘gym-fluencer’ list. If you need a quick fix pull up the ‘Love Island list’." Still confused? PRWeek took to Twitter in the hope of clearing things up, but responses were equally polarising. When exploring social networks- the influencer is the dominant node that exhibits the largest connections with engagement in micro societies/tribes. However, vanity metrics aside- an influencer is a change agent. Someone with an active / engaged following (doesn't have to be huge - ie micro influencer) but who combines authentic content with brand partnership content. Someone who creates original content that reaches *and engages* a lot of people within a specific target segment. Does it have to relate to social? An influencer could be anyone 'with influence' where you need it e.g. an MP, board/committee member, or even a Parish council. Or is that all a bit old fashioned? Someone hugely popular, who easily commands both trust and engagement from a wide community. I may have once added credibility to that description but I think with the rise of paid content/brand partnerships, this is increasingly less relevant. Someone who got very lucky with a social media post, which lead to others. Often members of society with no other hope of employment. The word itself has become quite idiomatic. I guess Influencer with a capital ‘I’ means someone with a social media reach with the ability to impact opinion and behaviour among that specific audience. The influencer with a small ‘i’ is often more powerful in the long term. 'A watershed moment': have people woken up to how their Facebook data is used following the Cambridge Analytica scandal?